Enjoy convenient warmth anywhere with this compact oil-free radiator from Dimplex. Thanks to its 700 Watt power output it heats up quickly, so you’ll soon be warm and toasty. With a single heat setting and handy thermostat controls that keeps a constant temperature, it’s really easy to maintain the perfect climate. This model also has a frost protection setting which prevents it from damage if you’re using it in cooler spaces like garages and outbuildings. There’s an automatic safety shut-off feature as well, so you’ll never need to worry about it getting too hot either. Quite compact, heats up quickly and produces good heat for 700w. Looks good and Keeps the room at a comfortable heat on just a low setting. Very happy with my purchase. Ideal to augment central heating to eliminate a cool zone in a living room or to keep a bedroom warm without having the whole house heated. Did a lot of research as just wanted a spare heater for the babies room. 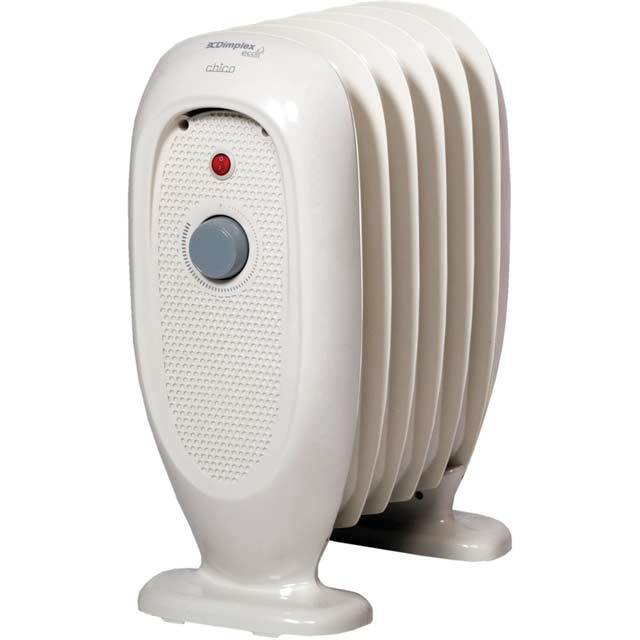 This is a small heater that’s very economical to run and does not have oil filled so is safe to touch. It does take an hour to bring the room up to temperature but is very quiet and suitable to leave on throughout the night. The smallest in the Dimplex range of oil free oil heaters . (I don't know how best to call them ) . All the advantages of an oil heater with none of the disadvantages . Its lightweight, its heats up faster and it heats a room more efficiently,and its actually cheaper to run than a standard oil filled one. So you wont be long before you get back the extra cost. Main advantage outwith running cost's, is the fact that oil heaters or oil free ones, dont use up the rooms oxygen, so great for not stuffing up your nose. There is a strong 'new' smell straight out the box, but just leave it to air somewhere overnight where it wont bother you and its fine to switch on next day, absolutely no smell afterwards. (And so silent ). It says don't use with an adapter plug, which is one of those plugs that transforms a socket so as you can attach 3 appliances, ALL heaters must have their own socket or else they will overheat that type of plug. Also don't use with an extention lead that is one of those that comes on a reel as the reel will ovetheat ( you must unreel the whole reel to use it with a heater, but a lot of reels nowadays come with a thermal protection switch. ) So a dedicated socket, one on a short extention lead to extend its range is fine. Its only adapters and 'rolled up' extention leads it says you have to be aware of. But that's the same for ALL portable heaters. If you are using a very long extention lead, like to a shed check its a 13 amp lead and its an 'outdoor' lead. Its very cute to look at and it is more substantial than photos suggest. This is Perfect for small rooms or places like sheds or conservertories or where a heater has to be on all day to just keep dampness away as its so cheap to run.